State government of uttar parades very soon going to publish official recruitment notification for the recruitment of accountant, assistant accountant , junior accountant and account officer for various department of uttar pradesh. This decision was taken by UP cabined on 3 November 2014. This is good news for those candidates who are waiting for accountant vacancy , clerical cadre recruitment for various government department of uttar pradesh. UP cabinet has approved the amendment in service Rules of accountant cadres this proposal was related to amendment in Lekha samvarg / accountant cadre . There are so many differences in the salary and recruitment process of different department of the same cadre. So government deiced to change the rule of accountant cadre . 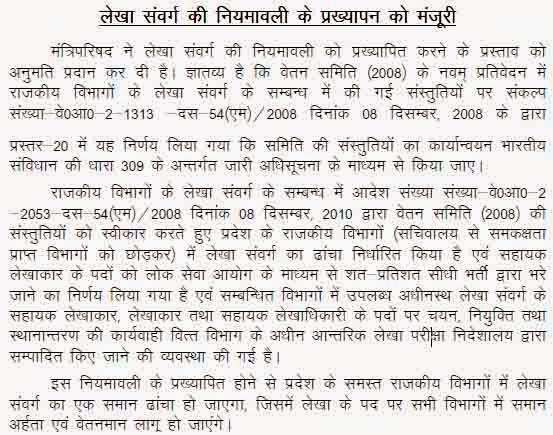 Now all recruitment process of sahayak Lekhakar / assistant accountant will be completed by UPPSC for all department. 100% recruitment will be filled through direct recruitment by Uttar pradesh public service commission. All department will send the proposal of the recruitment of sahayak Lekhakar to UP PSC for the recruitment . After the approving the niyamavali now there will be only one cadre of accountant in all government Salary and other benefit will be similar in all government department. After publishing the new niyamavali , now it seems very soon up psc will publish the official recruitment notification for sahayak Lekhakar posts. EXAMVACANCY.in immediately inform you here when official advertisement of सहायक लेखाकार will be issued by UPPSC.